The road to the campground is now paved as well as the campsites themselves. They are building a new bath house/laundry and it looks like it's almost complete. Verizon cell phone worked well. Verizon aircard also worked well, though I use an amp and external antennae so I'm not sure how it would be with a plain aircard. 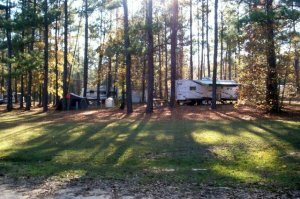 Overall a decent campground with plenty to do.